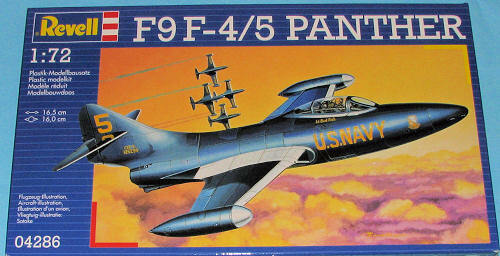 The Grumman F9F Panther was the manufacturer's first jet fighter and one of theU.S. Navy's first successfulcarrier-based jet fighters. The Panther was the most widely used U.S. Navy jet fighter of theKorean War, flying 78,000 sorties and scoring the first air-to-air kill by the US Navy in the war, the downing of aNorth Korean Yakovlev Yak-9 fighter. Total F9F production was 1,382, with several variants being exported toArgentina. The Panther was the first jet aircraft used by theBlue Angels flight team, used from 1949 through to late 1954. Variant of F9F-4, but powered byPratt & Whitney J48 engine, 616 built. No surprise to those who know that Revell AG bought Matchbox is that this 2009 boxing is in fact, the old Matchbox kit. Now that is not really bad as this was one of their kits that wasn't attacked by the 'mad trencher'. 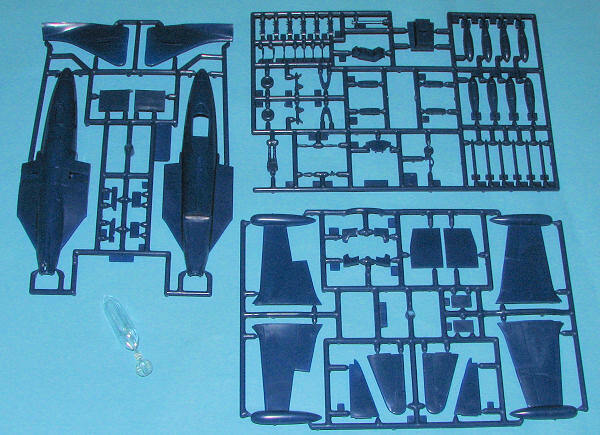 In fact, there is very little in the way of panel line detail and what is there is of the finely raised variety. Molded in dark blue, the sprues are in pretty good shape. I found some rather deep depressions on the upper fuselage, but they should be simple to fix. Typical of Matchbox kits, the detail is pretty simplified or missing from places such as the wheel wells and inner gear doors. This one actually has a cockpit with raised, but probably spurious detail and very simplified bang seat. A pilot figure is provided to hide much of the lack of detail. Wheels and landing gear are more like what you'd find on a toy and devoid of any real detail. Since Panthers did a lot of ground attack, the kit comes with a full load of rockets and bombs. The bombs don't look like those the US would use and are more shaped like British versions, which isn't surprising as Matchbox was a British company. The major option is for having the wings folded. No wing fold detail here, simply large, plastic tabs. These are bent for folded and flat ones if you want the wings level. This is all topped off by a somewhat thick but quite clear transparency. Markings are for two aircraft. One is the Blue Angels box art plane and the other is from VMF-312 in 1954. Decals are very well done in Italy and a huge improvement over the original Matchbox kit versions. There are also some aftermarket sheets that have -4/5 Panther markings on them, though none of them are recent. So, is it worth the current price? Well, that is hard to say. When PK-124 was first released by Matchbox, it was around $3.50, but this isn't the 1970s and this is a fairly popular aircraft as the LHS sells out every time it gets one in. Until someone decides to concentrate on USN 50's jets, we'll have to take what is out there.